Discussion in 'Home, Auto, Hobby and Computer Tech' started by Tay Bang, Aug 23, 2018. 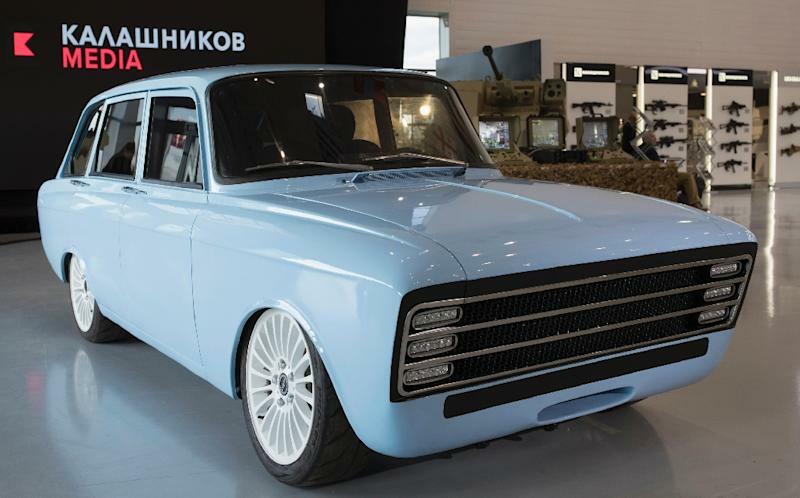 Moscow (AFP) - Russian arms maker Kalashnikov on Thursday presented its new electric car inspired by a rare 1970s model, saying the new technology will rival Elon Musk's Tesla. Paint it green and put a Che license plate, though. Very west coast progressive marxist chique. Not sure why there is a radiator cutout though. Needs a bike rack on top, for when it breaks down. I like the color and the wheels, the front has too much wind resistance for my tastes. I wonder how much it costs and what facilities will exist to service it. Tesla already has issues with service, especially when they have defects like I have heard recently. Audi introduces new electric car. Until they come with a mini reactor I’ll not be spending a dime on an electric car. And you can if you have enough money charge them from say solar or even wind depending on how much and where you drive. The costs are the issue and they won't be going down that much either. I heard someone say they would be going down to half. That is stupid, the frame, body, and many other portions of a vehicle are not going down. The batteries will go down but not that much. If you can afford say a 60K car that would be fine, I can't. In 1996, the Army and Navy were looking at them to be as small as a small generator on a tank sized vehicle (like M1 Abrams) for adjustable rate of fire and adjustable velocity per projectile rail guns.